My previous posts describing a reemerging Detroit took the stance that the city’s revival will only occur when the government retreats to the sidelines—a position that was vindicated by the experience of every entrepreneur I met, whether large or small. That said, there are some areas of law where the government cannot retreat from without risking all gains Detroiters have made. In case you hadn’t guessed, I am talking about the enforcement of basic criminal laws. At the start of my tour of Detroit, I was eager to see Fireweed Universe City, a community of anarchist squatters who have taken over an abandoned area of the city to make it their own, on their own terms. Could some kind of organized anarchy be the future of Detroit? Alas, organization and anarchy rarely go together: we never visited the place as apparently the anarchists became unreachable when time came to plan the visit. The signs of organized, or rather adulterated, anarchy are everywhere in Detroit. Some regulations are enforced, even those that impede change and growth, yet others are overlooked, even those that pertain to violations of basic criminal statutes. At times, this blind eye can seem like a blessing, perhaps a compassionate response to those trying to make a living in harsh conditions. Detroiters, for example, practice ridesharing on their free time (both day and night) to make extra money. One woman we talked to had goats in her backyard. Each goat yielded a gallon of milk a day. She told us that Animal Control ultimately turned a blind eye to a practice that is not allowed. In another instance, the police look the other way when some people use fire hydrants because they cannot be connected to the water system. Yet, much of this inconsistency seems to come from an allergic reaction to too much government intervention. After years of lavish spending and corruption, the resulting bankruptcy of Detroit has left its mark: neighborhoods without street lights, hour long wait times for the police to come when called, a disproportionate number of crimes remaining unsolved, firefighters fighting fires with holes in their boots. The list continues. Heck, in some circumstances, Detroiters have had no choice but to take responsibility themselves. 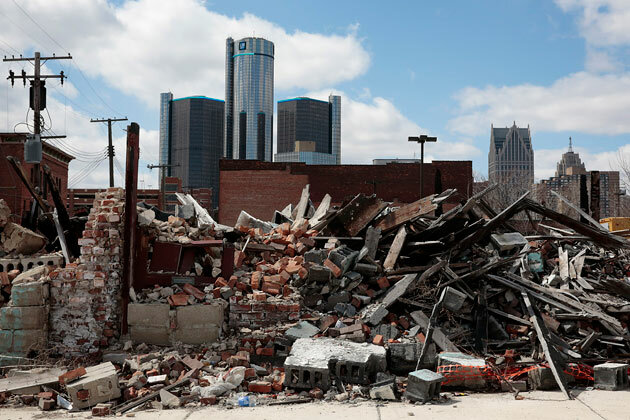 While the partial retreat of government may allow Detroiters to start businesses more easily or to cope with the situation, anarchy is not the solution for Detroit to renew with prosperity. Government does have a role to play, albeit a very limited one–that is, to protect the individual rights of life, liberty, and property. In one of my previous posts, I mentioned that a security card was necessary to access elevators of the Madison Block. While security keys in hotel rooms are generally for floors with penthouses and luxury suites, I was surprised to see that the Greektown Hotel required the use of your room key to access floors for any kind of room. Innovators and investors who want to help rebuild the city of Detroit need to know that they can work and live safely, and that the fruit of their labor will not be robbed or will not go to waste in a bureaucratic state that only makes their life more difficult. Anarchy is not a friend of determined Detroiters. As we will see in my next post, many communities and individuals are willing to help fuel the effort by helping make Detroit beautiful again.